The Lightning will be hoping to strike the Falcons for the second time this season, and if lightning does strike twice it will see Lancashire surge to the top of the table, as Yorkshire, the only side above them in the North Group not playing until Wednesday evening. The Falcons, however, will be hoping to avoid losing for a second time to the side in the T20 Blast this season and for a third consecutive game, which would see them draw level with their opponents on points in a very tight Northern Group. 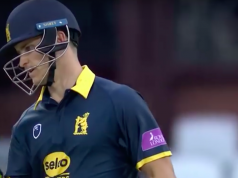 Falcons’ captain Gary Wilson has demanded a reaction following his side’s two previous losses, to Birmingham Bears and Nottinghamshire Outlaws – losses that have seen his side score 399 runs, but to no avail. One presumes the reaction he is asking for is from his bowlers, who conceded 424 in those two games. The reaction may be to see some changes to his side, possibly seeing the always economical Ben Cotton in the side for the first time this season. Lancashire, who won last time out and haven’t lost since the visit of Leicestershire, will be hoping for more of the same. Boosted by the availability of England superstar Jos Buttler and overseas star Junaid Khan, as well as experienced players like captain Steven Croft, it is easy to see why they are sitting second in the league. Both sides will be halfway through their T20 Blast qualifying campaigns following tonight’s game and, whilst a loss will not end either side’s hopes, it will certainly do more damage to Derbyshire’s than Lancashire’s efforts to reach the quarter finals. A victory will push both sides up the table and that’s what both will be striving for, and both will be hoping the weather stays away. The forecast at the moment says that, come the end of the evening, one team will be walking away with two points. Scoring runs has not been an issue for Derbyshire this season. Preventing them, however, has been. This means that Hardus Viljoen, their opening fast bowler, will be vital in helping them to overcome their guests. Viljoen is big, fast and nasty (on the field): everything you would want from an opening bowler, and his ability to take wickets will be key, as everyone knows the best way to stop batsmen scoring is sending them back to the pavilion where they can’t score runs. Viljoen can also score some runs down the order and is not afraid to club some lusty blows himself. Viljoen’s all round performance will be key for Derbyshire in this game. Lancashire have an array of stars: Buttler, Khan and Livingstone to name three. One who doesn’t get the superstar treatment, though, is Steven Croft. 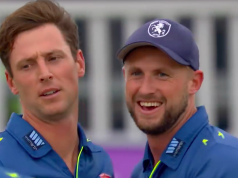 In the modern game spin is vital, and Croft gives Lancashire control – and stifling control at that, with his economy rate this season at just 5.88 runs per over. If Croft can bowl his four overs at a rate similar to, then Derbyshire’s high scoring batting order may struggle to score the runs the Falcons fans have become accustomed to this season. Derbyshire have named an unchanged 14 man squad for the game, although their desire to restrict the opposition’s runs may see them change their starting line up in the bowling department. The options to come in are Cotton or young spinner Qadri. If the pitch looks dry and likely to spin, Qadri may be the man to come in; if not then I think Cotton may be turning his arm over for the first time this season. Lancashire are yet to announce their squad, however they are likely to stick with what has worked so for them so far this season and keep the same squad that beat Durham last time out. The only absence for Lancashire is Jimmy Anderson who is away on England duty, but fellow international Jos Buttler will be at the 3aaa County Ground tonight. The weather looks set fair for the evening and we should be able to see a full game. Temperatures are forecast to hit the dizzy heights of 20 degrees, but under the lights as night draws in I recommend you wrap up warm. The pitches at Derbyshire have been recently used for the Women’s World Cup and have shown turn, but have played true and produced lots of runs. I predict runs, runs and more runs tonight, so fingers crossed.